Do you think you’d be happier if you could only lose 5, 20, 50 or more pounds? How much of your energy is spent thinking doubtful, negative thoughts about your body? Statistics show that 91% of women are unhappy with their bodies. 91 PERCENT!!!! 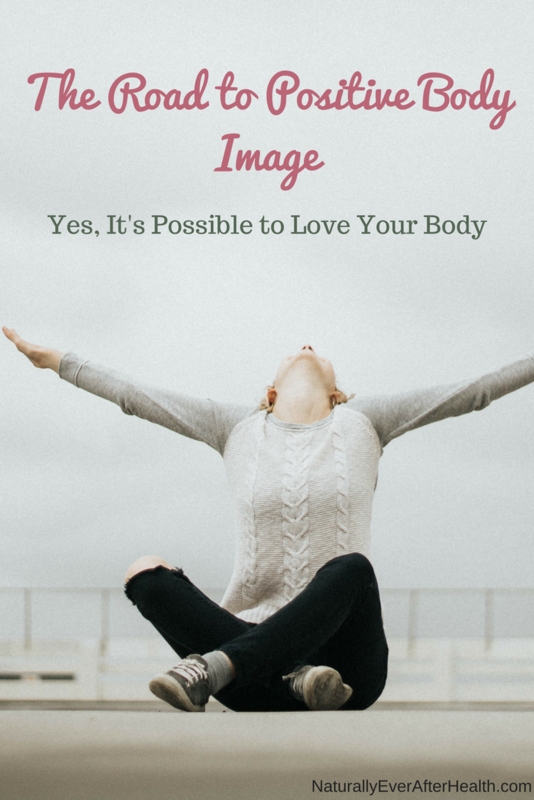 The road to positive body image isn’t easy to navigate nor is it the same for everyone, but tuning into your body – as much as you may hate it at times – is key for learning to love it for what it is. Loving your body is possible. If you’re ready to let go of body shame and free up that negative energy to focus on greater things, this post is for you. First, let me explain why I have to share this message with you. I never thought negatively about my body until I gained weight for the first time as a senior in high school. The pre-volleyball game four-scoop ice cream sundae stopped agreeing with me as the stress of college, grades and boys loomed over me. After high school graduation, I joined Weight Watchers. I was 17 years old and probably a measly 5 pounds overweight. To be clear, I didn’t join Weight Watchers initially to lose weight. My mom had the best intentions of getting me to eat better, not at all for weight loss but for overall health. I despised anything green and lived off pizza and ice cream. No matter how “perfect” your body appears to look, that is not a healthy diet for anyone. But I didn’t care much then to be healthy, so I didn’t take Weight Watchers seriously. Then, I gained the freshman 15. For the first time in my life, I was extremely conscious of my body. I was in this new scary world at college, meeting new people every day. No longer was I surrounded by the people I had grown up with, who I knew would love me no matter what I looked like. In this new world, I felt like I had to make an impression on people for them to give me a chance, and I did not feel confident in my physical appearance. At 18 years old, I went back to Weight Watchers, willingly, and the cycle began. Diet – lose weight – binge – shame – diet – lose weight – binge – guilt – diet – lose weight – binge – hate self. During this time, I was extremely sensitive to any comments made about my body or other women’s bodies. I was always comparing myself to other girls. No matter how much weight I lost dieting, it was never enough. I was never satisfied. All of my energy was focused on this vicious dieting cycle, and I was in college! I should have been having fun. I often say that I wish I could do my college years over, and this is why. My dieting binges escalated into full-blown Binge Eating Disorder accompanied by depression in my junior year. I hated my body more and more every day. I knew I’d hit rock bottom when I couldn’t make it through a day without crying. Throughout my 4 years of college, I obsessed over my body weight and dieting. I had great roommates and friends, but I didn’t form as strong of relationships as I wish I would have. That’s likely because instead of staying up late with friends, I spent the evening hours going over what I ate for the day and watching The Biggest Loser, (the joke’s on me, I was quite a loser!). I didn’t go out much because I didn’t want to drink my calories. Yet, if I was in a binge state, I would go out and drink and eat everything, then come back to the dorm a crying mess of shame and guilt, inevitably freaking out my roommates. I wish I would have given more effort to my studies and pushed myself harder to network and make professional connections. 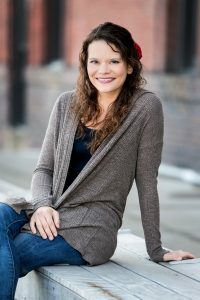 There were certain classes that I used for reading up on my favorite dieting blogs. I no doubt put more time into planning my calories for the week than homework. Thankfully I did pretty well with grades, but I really wish I would have given school more of my focus and energy. Not every woman experiences this severe of a hatred or obsession with their body image – at least I hope not! 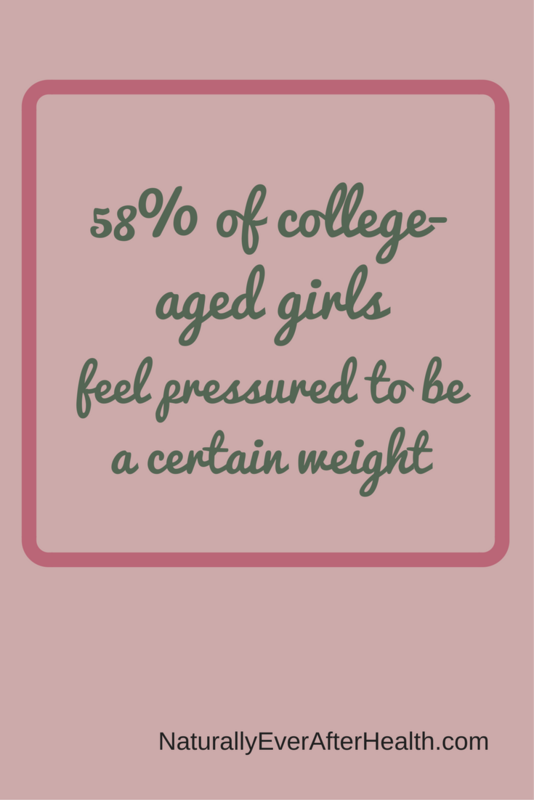 But 58% of college-aged girls feels pressured to be a certain weight. It’s up to them whether they crumble under that pressure, or realize there are far more important things to think about in school. I would never wish upon anyone an eating disorder or depression. Your body is your soul’s house, the temple that showcases your personality, allows you to play, travel and experience life and the things you love. It allows you to kiss, hug and accept love from others. If you can’t embrace it and accept it where it’s at in this moment, you’ll never be satisfied with it. You’ll never be able to fully give yourself to the things you care about. These negative thoughts only bring you down. I sure as heck don’t want shame and guilt over my body holding me back for the rest of my life, and I don’t want that for you. Over time, I let up on my body hatred, but those negative self-projections have nagged at me time and time again throughout my 20s. Now, at almost 28, I can honestly say that I love my body. I take care of it in a way that feels good and natural to me. I never count calories or completely restrict myself from any type of food. 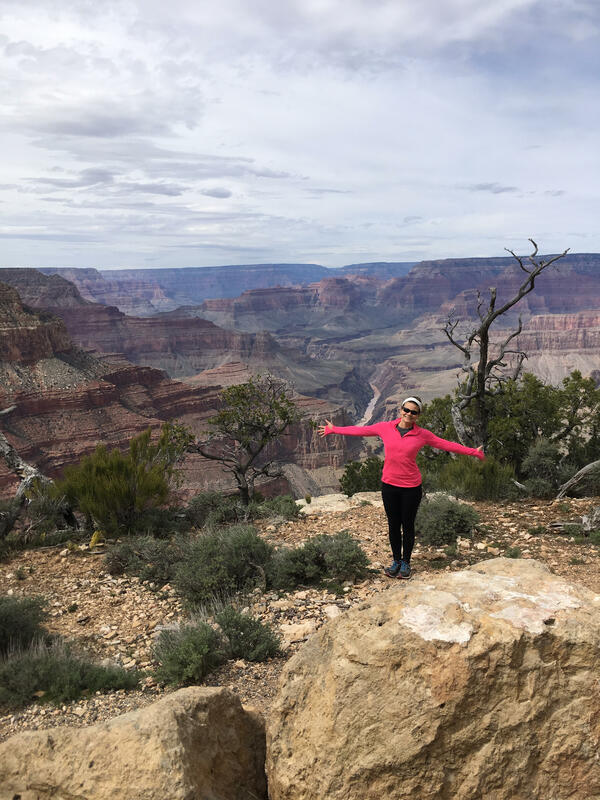 My body allows me to go hiking in the Grand Canyon, what’s not to love about that! Connecting with my body through meditation. Meditation was a game-changer for me. I started practicing it as a way to relieve stress, and my goodness has it worked for me! I’ve found that focusing on my breathing helps me remember what my body actually does for me. Guys, our bodies do so much more for us than simply look a certain way! I’ve used different podcasts for meditation, but now I simply do about 10 minutes of deep breathing when I wake up and before bed. Letting go of the trackers. 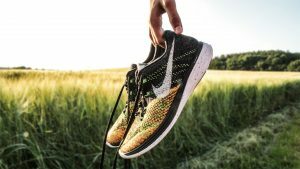 I finally stopped tracking what I ate and how I exercised. This was hard to let go of. Especially if you’ve done it for years or if you’ve had an eating disorder, it’s hard to think you can possibly trust yourself to eat without writing down the facts. But this is what creates guilt when you have to think about writing down that brownie you had at lunch. So what, you had a brownie? Sounds delicious! Who says you have to tell a notebook? Talking about it. In college, I saw a counselor. I also talked to my mom every day. Being open about this doubt was important since I was seriously depressed. For the first few years in my relationship with Kyle, I never brought up when I was feeling negative about my appearance. I didn’t want to sound whiny or stupid. But my silence about it actually caused one of our bigger fights, (which was about going to this deliciously greasy joint in Des Moines called Zombie Burger). It was actually far more stupid than if I had just told him how I was feeling. Now, I tell him when I’m feeling self-conscious in my body. I don’t whine or complain, I really just want him to know what’s going on in my head in case I’m acting different. He doesn’t try to flatter me and tell me I’m wrong. Rather, he helps me get to the root of what I’m actually worried about. He takes my mind off it. Talking to someone, anyone who is supportive, is huge. How Does Your Body Allow You to Enjoy Life More? I get it – it’s hard to be positive about your body. 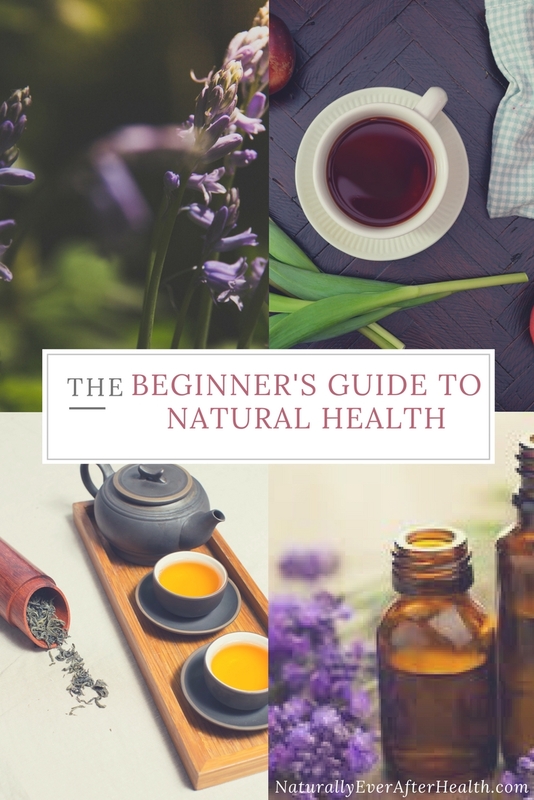 My goal with Naturally Ever After is to create a community that helps flip the statistics around. I want more women to feel good about their bodies, to praise their unique beauty and incredible gifts. Keep following along for more tips and strategies to love your body, no matter your shape or size. And please, leave a comment or contact me anytime if you need someone to talk to. Are you ready to stop body-shaming? Leave a comment below sharing gratitude for something your body allowed you to do today!